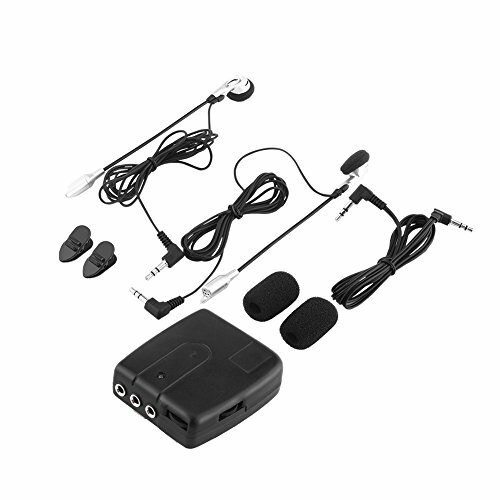 The set of bluetooth interphone is designed for universal motorcycle helmets, bike users. Functional design. Includes 2 headsets with speaker and mouthpiece. Clip on belt, pocket or arm. Ability to connect an additional audio equipment(CD, MP3, Radio). 【 Compatibility 】 The Motorcycle 6 Rider Large Group 1200M full-duplex stereo Bluetooth wireless helmet headsets, designed for installation into most half full-face, flip-front and full-face style helmets. 【 Convenient 】 This multi Bluetooth interphone system allows up to 6 riders to connect to each other. With the bluetooth Motorcycle Interphone, you can call hands-free on your Bluetooth mobile phone, listen to stereo music or voice instructions of GPS navigations by Bluetooth wirelessly, and have intercom conversations in full duplex with a passenger or multi-pair up to 6 Riders in a large group and talk between any 2 of them in a range of 1200M distance. 【 Performance Guarantee 】This product is compliant with the Bluetooth Specification, Real two-way wireless communication between six riders by Bluetooth system. 【 Easy to Use 】You only need to pair when you use it for the first time, then it can conduct automatic identification and connect next time. 【 Powerful 】 Up to 120km/h speed and providing 8-12 hours of use from a full charge. Come on get our high quality bluetooth motorcycle interphone at an affordable price. Get up and act soon!